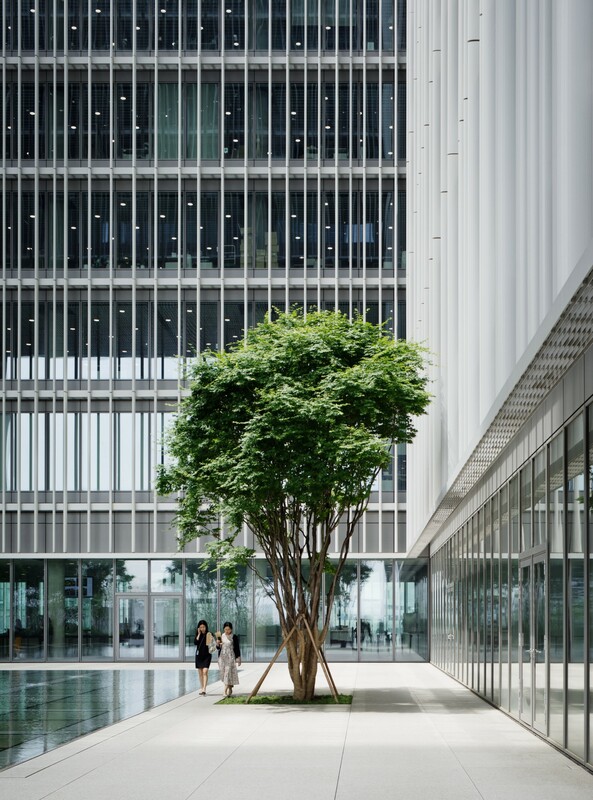 The Amorepacific building in Seoul, headquarters of the Korean cosmetics company designed by the Berlin studios of David Chipperfield Architects and inaugurated on June 15, is one of the projects selected for the exhibition under way in Vicenza. 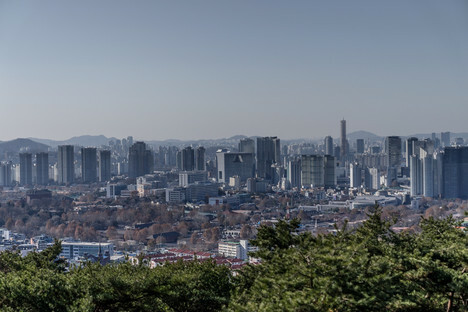 The new building in Seoul stands on land the company has owned since 1956 adjacent to a big public park (Yongsan Park) and an important financial district. The building is part of a masterplan that has transformed the urban fabric of the Yongsan district. The architects respond to the need to mediate between the small scale of the historic district and the new masterplan inspired by visions of the Modernist Movement with a building with a bold identity providing the city with prominent, large urban spaces. The construction stands around an open central courtyard which maximises the positive effects of natural light and ventilation on various levels in the building. Three big voids on different levels connect the central courtyard with the world outside and offer panoramic views of the city and the landscape. The three large voids which, like the central courtyard, seem to empty out the big, heavy volume of the building, also enclose hanging gardens which ideally allow the nearby nature park to invade the building, offering informal and recreational spaces for users on the highest floors of the company’s offices. The ground floor has direct access to the big central atrium open to the city at the heart of the construction. The central courtyard is the most important space in the building, a container for artistic installations, concerts, conferences and other cultural initiatives. All around it are public spaces including a museum, a library, restaurants and shops. The upper levels serve the company’s business functions and include not only offices but public spaces such as a large auditorium / amphitheatre overlooking Yongsan Park, a nursery, a congress centre, restaurants, etc. The façades are lightened by use of aluminium brise-soleil panelling which significantly improves the building’s environmental performance, shading its walls from the sun’s rays. The façades are composed of two layers which wrap all the way around the building, completing one another. The outermost layer composed of brise-soleil panels looks like a lightweight tent. Everything is perfectly calculated and designed to offer excellent natural lighting and not obstruct users’ views; the architects have designed four different brise-soleil panels which take into account the exposure to the sun of different façades in the arrangement of the aluminium strips. Behind these sunbreaks, the building has a second thermal skin made of floor-to-ceiling glass with opaque ventilation panels which allow improvement of thermal comfort. Project team: Isabel Albano-Müller, Wolfgang Baumeister, Wolfram Belz, Cyrell Boehm, Viktor Braun, Ronan Burke, Christian Busch, Rodrigo Carrasquer, Sophia Deckel, Caterina Decker, Paul Eckert, Rebecca Egan, Carlo Fischer, Alberto Franco Flores, Franziska Friebel, Nico Gaar, Rafael Heine, Anne Hengst, Matthias Heskamp, Wilhelmina Hoffmann, Frank Jödicke, Kristin Karig, Anke Lawrence, Ho Sun Lee, Pascal Maas, Franziska Michalsky, Lorand Mittay, Sandra Morar, Carthage Murphy, Felix Müller-Hartburg, Eve Neumann, Miguel Ortigão, Nicolas Pabion, Diogo Passarinho, Alexandre Pavlidis, Mariana Peralta, Lena Peters, Rosa Piepoli, Ilona Priwitzer, Maximilian Pudenz, Thorsten Rothmann, Susie Ryu, Josh Saunders, Noriyuki Sawaya, Diana Schaffrannek, Gunda Schulz, Marlitt Schwarzer, Lijun Shen, Vincent Sijssens, Caroline Stahl, Iason Tsironis, Jene Van Den Abeele, Gordan Vitevski, Marc Warrington, Max Werner, Robert Westphal, Malte Wilms, Kyung Ho Won.